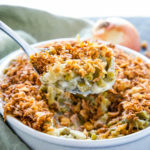 This Easy Vegan Green Bean Casserole is the BEST from-scratch classic Thanksgiving or Christmas side dish you'll ever taste! No canned soup and no dairy! Preheat your oven to 325 degrees Fahrenheit and grease a 9-inch by 9-inch baking dish (or roughly equivalent size) with 2 teaspoons vegan butter. Add the green beans to the baking dish and set aside. Heat a large saucepan over medium heat and add the olive oil, onions, garlic, and thyme. Saute until the mixture is fragrant and the onions are very soft. Add the vegan butter and when it's melted, add the all purpose flour and whisk until the mixture becomes thick. Add the white wine and continue whisking until the liquid evaporates, about 3 minutes. Add the oat cream and water and stir to combine. Turn the heat to low and stir the mixture regularly until a thick sauce forms (this will take a few minutes). Pour the sauce over the green beans in the baking dish and toss gently, just to make sure the sauce is evenly distributed. Smooth out the top and sprinkle the crispy fried onions over the top. Bake at 325 degrees until the sauce is bubbly and the top is golden brown (about 20 minutes). Feel free to substitute the oat cream with other dairy-free cream (soy or coconut cream works too). Replace the white wine with vegetable stock, if desired. For a non-vegan version of this recipe, feel free to use half and half in place of the dairy-free oat cream, and real butter instead of vegan butter.